Former President George W. Bush has re-emerged with his version of his story in a new book in which he discusses his life and his presidency. ­Speaking about his book, “Decision Points” with NBC’s Matt Lauer he discussed his convictions and his addictions. “I think his silence has been golden and it will be difficult for him to rehabilitate his reputation here in Washington,” said Steve Hollman, a Maryland Resident. But for many other Americans, absence has made the heart grow fonder. “Personally I think he was a strong leader and one of our great presidents,” said Miles Taylor, a Washington, DC Resident. A recent CNN/Opinion research corporation poll shows that Americans believe Obama is a better president than Bush, 47 percent to 45 percent. But that two point margin is down from a 23 point advantage one year ago. “The midterms was them speaking out again so I think it’s probably timely that the book is coming out now because this is precisely the point at which those people who supported the President are coming back into the fold,” Taylor said, moments after purchasing the book from a downtown Barnes and Noble. It appears for some the answer is yes. Even at the lowest point in his presidency, Bush had nearly a fourth of the country approving of the job he was doing. As far as his legacy, whether his book is an attempt at defending it or redefining it, it seems that mission may already be accomplished. Filmmaker and blogger Danny Schechter explained that many Americans see Bush as a relatable guy, based on a mythic persona as opposed to the Bush that lead the nation as President. 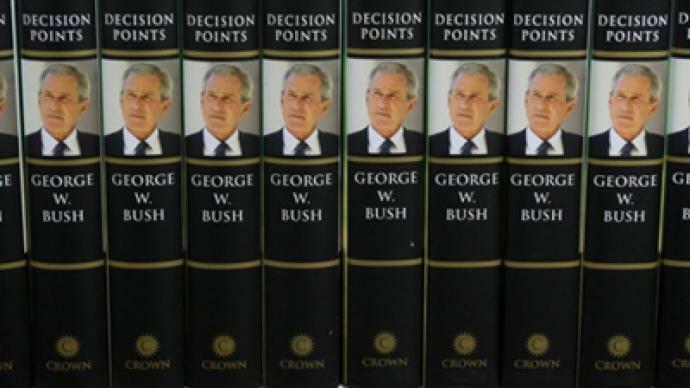 “They are actually selling George Bush this mythic person instead of George Bush this failed President, and that registers with a lot of people, particularly those who don’t pay to close attention to politics and policy,” said Schechter. Two years ago it would have been hard to imagine Americans being reminiscent of the Bush years. His policies, the recession and other issues that occurred during his administration have yet to be solved. Schechter argued that Americans are angrier at the economic situation, not Obama. The lack of jobs and the declining US economy is more reflected in popular opinion that proposed policy. “With Obama there is much more mixed feelings, particularly among his supporters, he hasn’t turned out to be the messiah people were hoping for,” Schechter explained. Watch the full interview with Danny Schechter.